Steve Hagerty presents the Kentucky bourbon he won in a bet with Lexington Mayor Jim Gray. The event was hosted at FEW Spirits, an Evanston distillery. 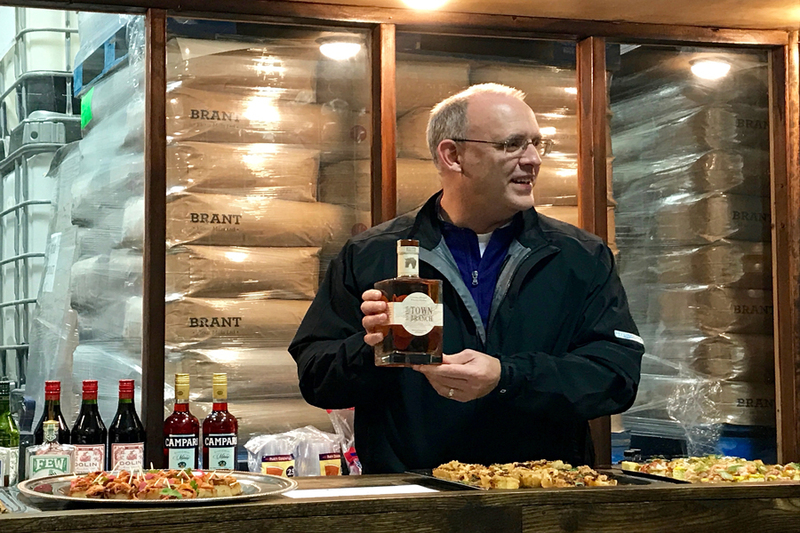 FEW Spirits is internationally recognized for its Evanston-made bourbons and whiskeys, but it was Kentucky bourbon being poured out Wednesday night in the distillery’s tasting room. In December, Evanston Mayor Steve Hagerty wagered a bottle of the town’s best bourbon over the outcome of the Music City Bowl with Lexington, Kentucky Mayor Jim Gray. The loser in the battle between the Northwestern and Kentucky Wildcats would ship a bottle out to the winning party. Thanks to a failed Kentucky 2-point conversion in the final minute, Northwestern secured itself a 24-23 victory and Hagerty a free taste of Kentucky bourbon. Hagerty — who has held NU football season tickets for 12 years — hosted “Hagerty Huddle” at the distillery, 918 Chicago Ave., to celebrate the win and acknowledge businesses on the Main-Dempster Mile. “I thought this would be a good opportunity to get people together from the community and we can all share the bourbon and celebrate Northwestern winning,” Hagerty, who was wearing an NU pullover, said. The event attracted around 20 Main-Dempster business owners and employees who navigated their way to distillery, which is tucked away in an alley near the CTA purple line tracks. Hagerty said Gray did not attend the event because he was waiting until the weather got warmer to visit. Evanston, home of the Temperance Movement, was dry before it was even founded in the mid-1800s, thanks to NU. The University prohibited the sale or manufacturing of alcohol within a four-mile radius of campus until it overturned the rule and approved the sale of alcohol in 1984. Nearly 30 years later, owner Paul Hletko — a lawyer turned master distiller — opened FEW, Evanston’s first distillery, in 2011. The Main-Dempster Mile is comprised of more than 200 small businesses, the majority of which are independently owned, said Katherine Gotsick, executive director of the Main-Dempster Mile. Evanston is home to three breweries — Sketchbook Brewery, Smylie Brothers Brewing Co. and Temperance Beer Company — in addition to the distillery. FEW currently ships its spirits to 30 states and 20 countries, but plans to reach all 50 states within the next year, FEW employee Zach Yeates said. He added that the distillery carries a core line comprised of three gins and two whiskeys. Located in a former auto repair shop, the distillery invites Evanston community members to attend vinyl nights hosted in the tasting room on Thursday nights. During the summer, the tasting room opens up into the alley to host a food truck and music that pairs with the hand crafted drinks.